Get more affordable workers comp for salons, spas, beauty parlors and massage parlors. Save money on insurance with our Target Salon and Spa Insurance Programs. 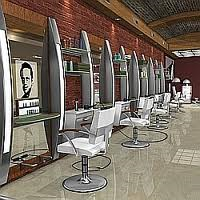 There are just under 400,000 beauty salons, barber shops, nails salons, and spas in the United States, according to 2014 national data sources. While many national and regional insurance companies offer coverage options for these industry segments, rates may vary significantly between carriers. Our agency helps salon and spa owners save 15% or more on their insurance coverage. Find your best quote today. 9586 Hair Styling, Barber Shop, Beauty Parlor. This is a vary broad classification and applies to most types of personal grooming services for men or women involving all parts of the body. Typical business under this code include beauty parlors, barber shops, tanning salons, day spas, tattoo parlors, make-over salons, etc. 9063 Clubs and Salons- Health and Exercise. This NCCI class code covers many types of spa and club businesses including massage salons, fitness clubs, health clubs, gym's, and exercise clubs. Also includes YMCA and related organizations. 8018 Beauty Supply Store- Wholesale. Barber and beauty supply houses and wholesale beauty supply sales. 8044 Spa and Hot Tub Dealers. The standard classification for spa, sauna, or hot tub dealers. Includes delivery and installation. 9053 State Special Code for CA and NJ. CA- Applies to fitness clubs, swimming clubs, and tennis clubs. NJ- Applies to fitness clubs and health spas. 9055 New York State Code. Applies to most exercise or health clubs in NY. NOTES We offer exceptional workers comp rates for most hair, nail, massage parlors, and fitness clubs. See if your business qualifies today. Hartford offers spa and salon programs including business owners, liability, property and work comp. Travelers is a national carrier with some of the best rates on fitness clubs and massage parlors. First Comp is one of our top markets for new and small businesses in the salon and spa industry. AmTrust's Salon Program makes the quoting process fast, easy, and affordable. Employers'' Spa Program comes with additional credits and discounts on wc coverage. Accident Fund offer low average rates on select types of businesses with the industry. In addition to workers compensation insurance. Ask about our package programs including GL insurance, property, and business owners coverage for salons, spas, and exercise clubs. There are a lot of agencies that have insurance markets that offer workers compensation for beauty salons, spas, and fitness clubs. But we've built turn-key programs with some of out top carriers to help business owner find the lowest rates every time..
Start a workers comp quote today to see if your salon, spa, or club qualifies for the better rates on your next insurance policy. Or give our Specialists a call today at 888-611-7467.